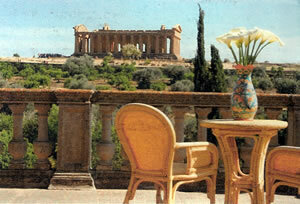 Every civilized traveller must, sooner or later, visit Agrigento, on the island of Sicily. Why? Because its 5th century B.C. Temple of Concord is – after the Temple of Hephaistos in Athens – the best preserved Greek temple in Europe. Sited on a hill overlooking the sea, this perfectly proportioned structure seems too good to be true. It is a blessing to the eyes, and the benediction is increased when one looks away and then looks back again. You will want to gaze upon it as the sun rises and as the sun sets and in the heat of the noon-day. And that is why you will need to stay at the hotel which allows you to do just that – the Villa Athena. Now, let me say at once that the Hotel Villa Athena is not the sort of luxury establishment which usually appears in Bown’s Best. 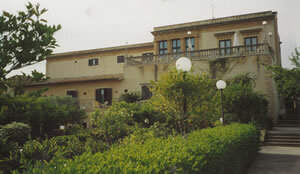 It is a handsome 18th century villa, which has been sympathetically extended. But its interior is functional, rather than elegant, there is no lift and you will have to be careful that your bathroom has a tub, rather than just a shower. 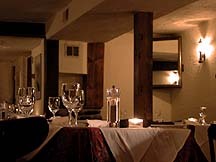 Its prices are modest, beginning at just 210 euros for a double room (with air conditioning) and breakfast. I would suggest that you make sure that you occupy room 205 (a ‘superior room’ and therefore 260 euros a night), for this has its own terrace. And from this terrace there is The View. The Temple is about 150 yards up the hill from the Villa, and it makes a spectacular backdrop for the hotel’s pretty and carefully tended gardens. It was one of my real delights to sit in the shade of a tree in this garden, with birdsong all around, sip a glass of chilled chardonnay and allow my sight and thoughts to be dominated by the achievement of the Greek builders. Two and a half thousand years ago, their brilliance and expertise produced a masterpiece. And now it was there on the hilltop, in front of me. Most of the smaller artefacts from the Valley of the Temples have been taken to the Museo Regionale Archeologico, a minute’s drive along the road from the hotel. 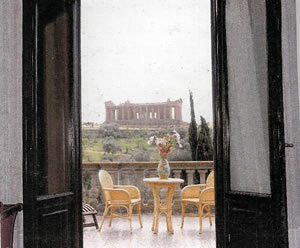 When I found the strength to leave The View, I went there and was taken aback by the Ephebus of Agrigento. I am so used to seeing Roman copies of Greek sculpture: I was not prepared for the perfection of this marble statue of a young athlete – also from the 5th century B.C. 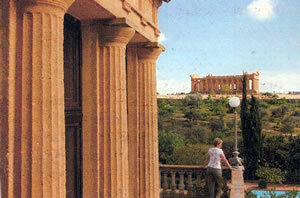 Another of my excursions was into the city of Agrigento itself. Non-Italians sometimes remark to me about the difficulty of driving in Italy. But it is really quite simple, if you observe the following rules. Drive as if you are walking, knowing that you might have to stop suddenly or move this way and that to avoid a collision. Remember that most other drivers on the road are already very, very late for an engagement of immense importance and that you are in their way. A few, however, will trundle along as if they have already died at the wheel. On no account suppose that any pedestrians you encounter can either see or hear. With these rules in mind, your motoring in Italy will be fun. Still, unless your nerves are considerably stronger than mine, it might be better to avoid the centre of Agrigento. Some of its streets are perilously narrow, and I almost came a cropper, having turned into lane which was not wide enough for my hire car. This was on my first day, so that evening I needed some good food and decent drinking. 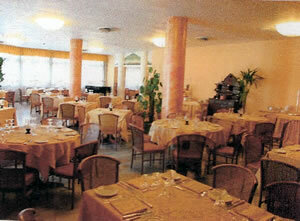 And that is what I got in the hotel dining room, named the Ristorante Concordia. Sadly, it does not have The View. Still, this brightly lit chamber – in a separate building from the main house – has a marble floor, yellow tablecloths and a jolly mural of gods and horses. My spirits lifted as soon as I walked in. And they went up further when I spied Francesco Vaccarella. Signor Vaccarella is a maitre d’ who conducts himself with a certain flourish. Such panache appeals to me. He and his waiters, dressed in black tie, looked after me very well throughout my stay. From the various dishes I tried from the daily menu (which is what is offered to those, like myself, staying on half-board), I liked particularly the ravioli with pesto sauce and almonds, the gnocchi with vegetables and tomatoes, the grilled steak with chips and the tarts on the pudding trolley. As you will have gathered, this cooking is simple and straightforward, but the ingredients are good and properly handled. The wine list is also simple and to the point. 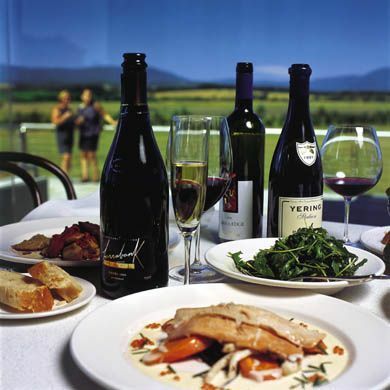 From its 60 offerings, I would direct your attention to a firmly structured white, with a nose of melon and lychees, made from the grillo grape (Altavilla, Grillo, Firriato, 2006 – 18 euros). Ask for larger glasses and you will be given good ones, made by Schott. It was here in the dining room of the Hotel Villa Athena in Agrigento that I finally solved one of the great gastronomic puzzles of my travels. I often find, at the breakfast buffets provided by many hotels on the Continent, that there are boiled eggs, but no egg cups. What to do? I had no idea, until the solution came to me here. I took off the shells and placed the eggs into a large coffee cup, and then ate them with a spoon in the usual way. Brilliantly simple and simply brilliant. I attribute this small revelatory miracle to the gods of the Temple of Concord. For they hold sway over this whole place. And their Temple is the reason you will want to stay at the Hotel Villa Athena. 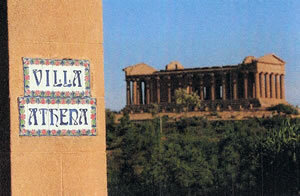 Via Passeggiata Archeologica 33, Agrigento 92100, Sicily, Italy.